We generally eat dinner pretty late. Tonight we pushed the envelope a bit by having dinner at 11:00 PM. Jen was working late so I threw together some leftover bits from the fridge so that we could have something quick to eat at the time when we'd be asleep on a normal night, preferably for at least an hour. 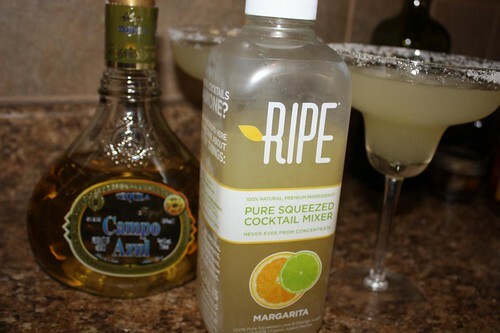 I had purhcased this margarita mix from a company called Ripe Margarita Mix based locally out of Wallingford, Connecticut. It's made with fresh squeezed oranges, limes, and agave nectar. The main reason I made margaritas is because I had purchased this mix for when Jen's mom and sister were in town. 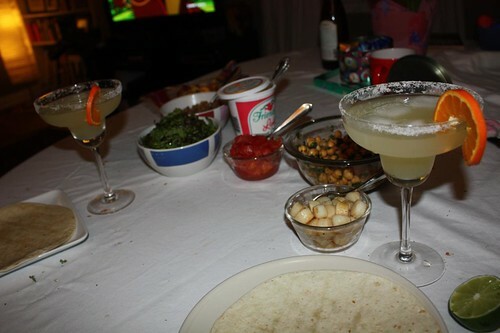 When I went to make margaritas for them one night I noticed a key ingredient was missing: tequila. So today I went to the wine store in town where they sell a small variety of spirits. I asked the guy at the counter for a recommendation and he recommended two tequilas. He went on about the merits of one versus the other. This one had more agave, while that one had bluer agave. This one was cask aged and that one was more crisp. I think "crisp" might be a nice way of saying "harsh." After weighing the pros and cons of things that I cannot understand I went with the one that was $2 more figuring it was probably better and worth the risk of that small an investment. I cleaned out the fridge (and some items from the pantry and freezer) to make an odd mix of food for tacos. I defrosted some leftover frozen tortilla shells. I had hoped to make beans and rice but discovered that we did not have any black beans. Since my goal was to not go to the store this week's dinners I opted to go with garbanzo beans. 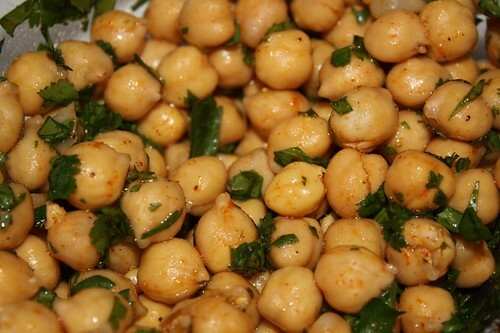 I made a salad by tossing the garbanzos with lime, cayenne, and cilantro. Then I cooked up some scallops with a similar seasoning blend and also a batch of toasted brown rice. I also chopped up some tomato and red leaf lettuce. Only now did I realize that I forgot to shred up the cheddar in the fridge. I'm not a big fan of margaritas but I am, however, a fan of using things up before they go bad. That forces me to eat a lot of things that I otherwise would not. 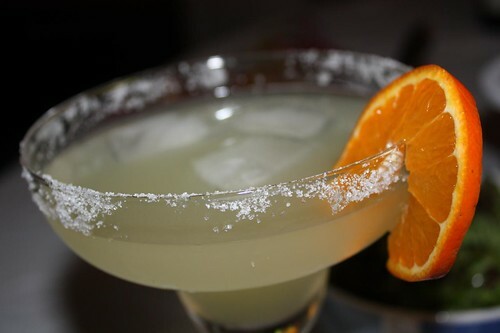 The best part of the margarita for me was the Mineola tangerine I used as a garnish. It was the last in what was the tastiest batch of citrus I've ever purchased in my life. Tonight's dinner had an air of reaching the end of the road. There's precious little left in the fridge to play with at this point. Tomorrow may be the day when we admit we have no other choice and have to either go shopping or have dinner out. I'm confident I could do something with what we still have left but it would probably be too weird so that it would tip the balance of the Resourcefulness/Sadness Scale that I have worked so hard to keep level all week.